When was the last time you had a lengthy chat to a friend over the phone or, rarer still, a decent face-to-face catch up? Remember spending time with a loved one making the most of precious hours having saved up every story, anecdote and interesting conversation starter up your sleeve? Nowadays the bulk of our relationships seem to be conducted via text. It’s not just SMS. We now have so many different ways to communicate 24/7, if you also include email, social media and video as well as phone calls. We are adapting the way we communicate to suit these means. Communication now tends to happen in brief, rapid-fire snatches and it can feel like conversation is becoming a lost art. Is technology really making it easier? It’s certainly not all bad. Much is made of the way that social media makes it easier to connect with friends and family you don’t see often. There’s a reason that Facebook’s tagline is somewhat emotive: ‘…helps you connect and share with the people in your life’. On the flip side, proud Luddites say that communicating might be easier than ever, but it’s a lot less meaningful. Sometimes it seems like they’ve got a point. There’s a big difference between sitting down for a cuppa and a chat with a friend and getting a text that’s basically four words, perhaps with a few nonsense vegetable emojis thrown in for good measure. It’s so easy to misconstrue the tone of a text, it can be hard to tell if someone is serious or pulling your leg. Think of how much is conveyed with a smile, a grimace, an eye roll or an arched eyebrow. That’s why emojis were invented, to help us to more easily navigate the complexities of not being able to see the expression on someone’s face or hear the inflection in their voice. We are also becoming more glued to our devices to the detriment of real life connections. It’s not hard to miss, say, the pair of high schools girls walking side by side texting furiously, the table of friends ignoring their lattes in favour of their screens or the couple checking out their socials instead of each other. Of course, there are exceptions to every rule in this debate. For every person who feels like they’ve missed out on connecting face to face, there’s a person in dire straits who’s been able to reach out to strangers – think things like medical crowdfunding.ii And that’s without even touching on the millions of conversations that happen every day on dating sites. While we are certainly not advocating forgoing the convenience of technology, being able to initiate and maintain a conversation is an important skill. Conversations are good for the soul, and the river of words that flows and pauses and goes off on tangents helps you to develop and express your ideas. 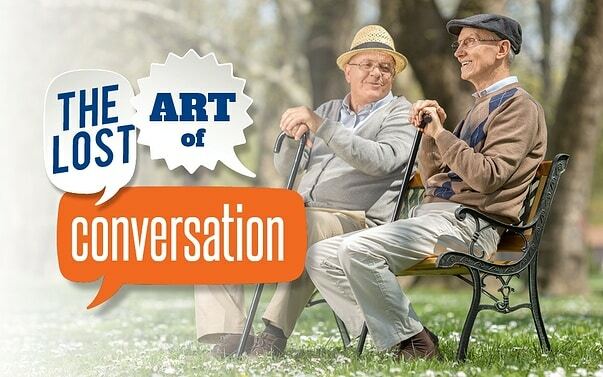 If you’re interested in reclaiming the lost art of conversation, there are some simple steps you can take to have a more meaningful connection with those you care about. Limit your use of technology at the dinner table and be ‘present’ with your loved ones. Conversations are about listening as much as speaking, ask questions and try not to interrupt the speaker. Look into the speaker’s eyes as you talk and take notice of their body language and facial expressions.